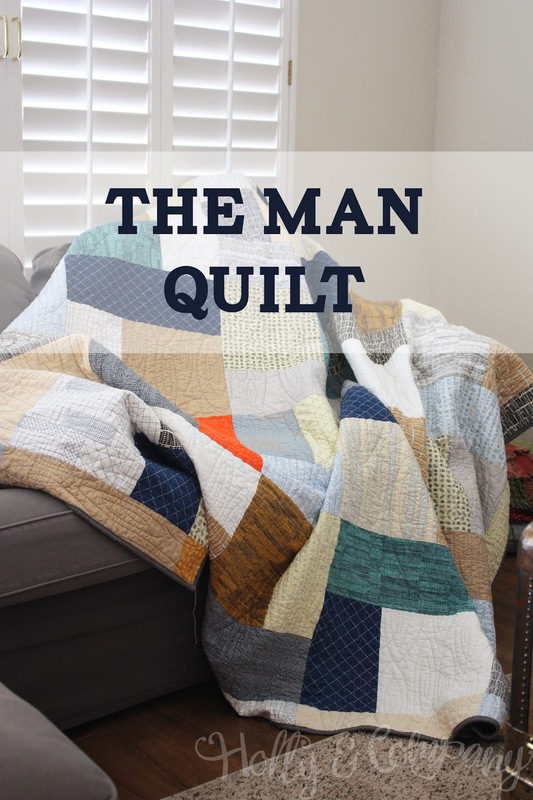 I'm finally sharing this masculine quilt I made for my husband. Over the years I've made many quilts. Most of them are lap to twin size, meaning about 70 x 80 inches or smaller. Many of them reside in a pile next to our couch or rolled into baskets around the house. We use them to snuggle or for picnics or when the power goes out. 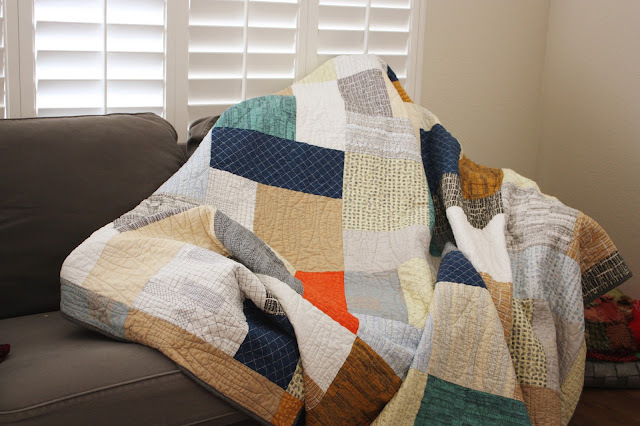 But last year, Ryan brought to my attention that 1) I had not made a quilt for him and 2) none of our current cuddle quilts were long enough to cover him head to toe. I just looked back on Instagram and I started cutting this quilt a year ago. Wow, that actually seems pretty fast for finishing a quilt. Usually it's a years (yes, plural) long process for something this big. The pattern I used is called Turning Twenty. It uses 20 fat quarters, hence the name. Through various turning of the blocks, you can create several different patterns. To make the quilt extra-big, I added 5 extra fat quarters, making this Turning Twenty-Five. The quilt is about 90 x 90 and perfect for my 6 foot tall husband. I quilted it with a light grey thread in a ripple pool type pattern. The fabric is Doe by Carolyn Friedlander. 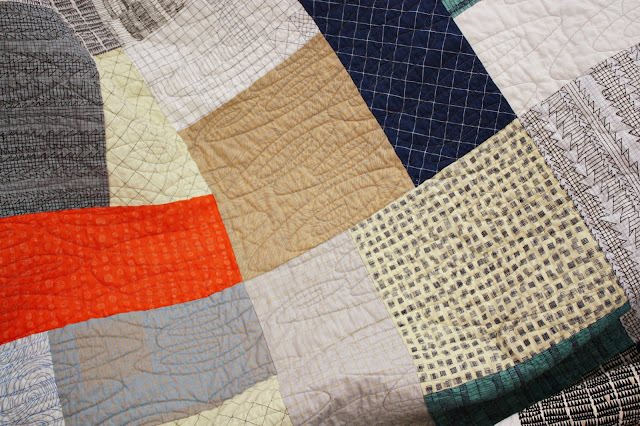 It is from 2014 but there are still many options to buy on Etsy and other online quilt shops. It's a gorgeous neutral palette with a few pops of color. 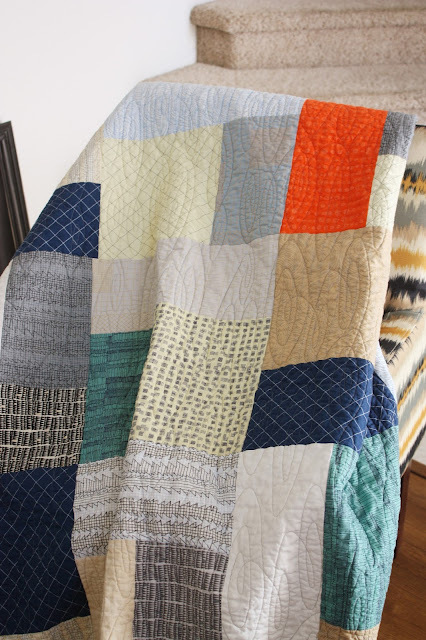 If you are making a quilt for a man or want a more masculine color palette, Carolyn's fabrics are usually a good bet. This is now in permanent residence on the couch in our family room. It gets used every single day without fail. Ryan wanted a blanket just for him, but he usually ends up sharing with one or both of the ladies in his life. I'll immediately seize your rss as I can't find your email subscription link or newsletter service. Do you've any? Kindly permit me recognise in order that I could subscribe.